Ruthiebear (Titusville, NJ, United States) on 1 November 2012 in Lifestyle & Culture and Portfolio. As I was taking photos of the scarecrows in the contest, I could not help but notice the variety and oddness of their feet/shoes. Here is a collage of some of them. Update: Still no power, water etc. The power company is now saying no power until November 8th. Our generator is small and cannot run the furnace or well pump. Once a day I can access the internet, so will visit as many as I can. Thanks for your concern. A great collection and presentation Ruthie. I hope the situation improves soon, and you get power again. @Michael Fresh: Thank you. I am glad I had pre posted my images here before the power went out, as I cannot access my desktop where all my photos are stored. Très belle mosaïque! Chacun trouvera pointure à son pied ! a great idea to do the collage (& take the photos of the feet)...love it! A great collage of different shoes! I wish you good luck, all will return to normal again!:-))HALEJA. @Oiva: Thank you. We are thankful to have a generator, and there was no damage to our home. @Doug: Thank you. In the meantime we are doing our best to stay positive. We remind ourselves of all the good things, like stove works, generator keeps food fresh, my sleep apnea machine can run at night etc. Praying that your utilities people pull out all the stops! @Curly: Thank you. I know they are all working round the clock all over the state of NJ trying to restore power. But it is so massive an outage, and we are just a small rural community, we are last on the list. Great idea and marvellous mosaic of feet! Hope your situation improves rapidly. @Stephen: Thank you. SO many people are without power and trees are down, taking the electric wires with them, it seems unlikely we will get power anytime soon. @kiwisa: Thanks yes, the 8th is far away while we have no power. We are wondering what happens on the 6th which is presidential election day here. Hope you will get the electricity soon. @Sarito: Thanks. I am thankful for our generator in the meantime. I hope you get the power back sooner than they said you would. I hope all is as good as it can in the situation you are now! @ursulakatariina: Thank you. We are handling it well. I go to the gym daily where it is warm and I work out. Many entire families are there charging their devices and showering. A terrific of showing all those many feet ... and shoes! I do hope your power will be restored before the 8th! Our son-in-law stood for 2.5 hrs yesterday to get gas for his generator to hopefully save food in the fridge & freezer. Prayers all around! @Judy aka L@dybug: Thank you. My hubby had no trouble getting gas for the generator here this morning. SO we are good to go for a few more days. Thank goodness our stove is propane so we can still cook meals. I got a supply of aluminum pans we can throw out. Ha ha - this is a really fantastic idea. Joyce (TwoJays) should love all of this footage. LOL Really great work here, Ruthie! What a great collection ! Thanks for gathering them all for us here. So many varieties !! Great présentation ! Wunderbar diese Serie von den Füßen. Ich hoffe das sie mit dem Strom früher fertig werden. @Heinz: Thank you. I hope the power will be on sooner also. A great collection! I hope that everything goes to normal as soon as possible for you and all the people affected by Sandy! @Denise: Thank you. There are so many of us without power. 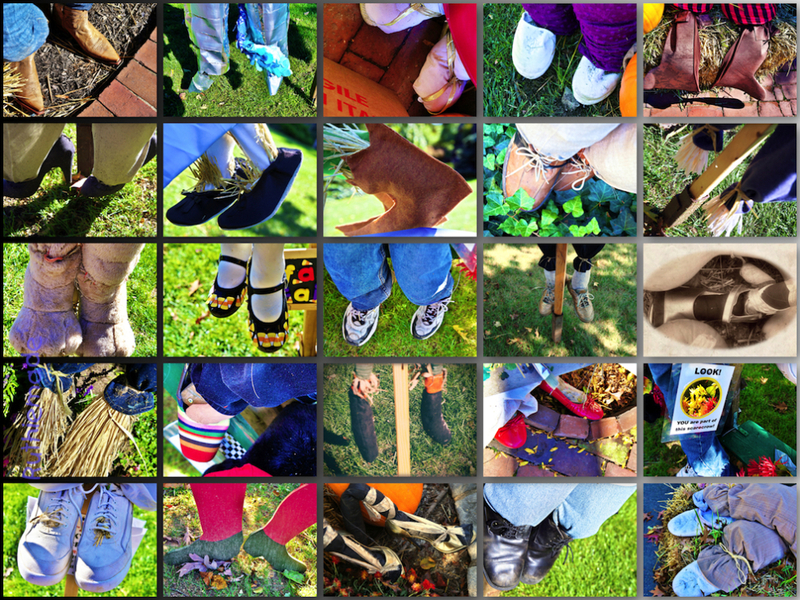 Excellent collage of all these feet, some have nice shoes, a very good job of reportage. I love the series. @Anthony Morgan Lambert: Thanks for your kind words. We are doing very well considering everything. A bit cold so are bundling up with layers. This collection of "feet" makes an excellent follow-up to your series. I'm glad you can get on even if its a limited time. @Don: Thanks. Our little generator has been very kind about letting me get internet a bit every day. The makers of these scarecrows didn't overlook the details. An interesting collage. Quel ensemble sueprbe ces vignettes fnatasique ensemble c'est le pied. Great capture many feet scarecrow. Original and good colors and light. Good day and I hope that your problem is resolved quickly electricity. Wonderful montage of feet!! Am following the storm on the News channel and hoping everyone keeps safe. Sending you our best wishes. This collage nicely photograped and presented. I hope the power repaired quickly. So eine lustige Sammlung ! Ich wünsche ihnen alles Gute und daß sich das Leben bald wieder normalisiert ! Great collage of shoes ~ fantastic presentation! That's alot of shoes too! I hope your power returns sooner than they anticipate; did you experience alot of damage and high winds in your area? We are thinking of you and your family ~ take care. What a nice collection of feet, and above all very cheerful color. Super! Hopefully the utilities soon returned to normal, a lot of strength in surviving. Such a clever idea. Greatly accomplished to show off the variety of Scarecrow feet. Well done! Love this. My prayers are with you in this time of loss of power and hardship. How in the world did you do this…? Well Done. very attractive compilation of funny feet! sorry to hear of your predicament; hope all will be well before the 8th !!! This is really cute, Ruthie! Nice presentation. How cool is this?! Very creative. oh cette idée me séduit beaucoup.. j'adore cette idée !